Since I get so many requests for Indian recipes, I figured I've give this recipe a try. Yes, it's mac n cheese, so you know it's all about comfort, but the addition all the warm Indian spices is a delicious twist that makes it into a whole new mac n cheese experience. It's just as easy to throw together and it's delicious! So if you like Indian flavors, you absolutely MUST make this. It's SO rich and warm and it's the perfect thing for a chilly night. Chris and Claire are always talking about how much they love Indian cuisine, and they LOVED it when I made it for one of our Sunday dinners. So, big thanx go out to the Spice Goddess, Bal Arneson, for contributing another delicious recipe to my growing collection of Indian recipes! Try it! Preheat the oven to 350 degrees F. Grease a 9-inch-by-13-inch ovenproof dish with 1 tablespoon of the butter. Fill a large pot with water and place over medium-high heat. Bring to a rolling boil and season with some salt. 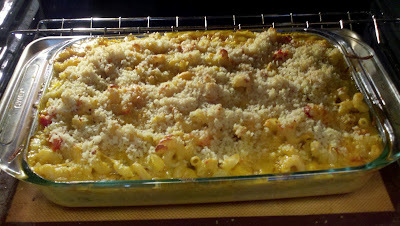 Add the macaroni and cook until tender but still firm, 8 to 10 minutes. Drain. Melt the remaining 2 tablespoons butter in a large skillet over medium-high heat. Then add the ginger, garlic and onions. Stir and cook until the onions are just beginning to turn golden, about 5 minutes. Add the garam masala, cumin, turmeric, paprika, cardamom, chili powder and tomatoes and cook for 5 minutes. Add the flour and a pinch of salt and pepper and stir for about 2 minutes. Slowly add the milk and continue to stir as it thickens. Cook until the sauce is thick enough to coat the back of a spoon, 15 to 20 minutes. Add 3 cups of the cheese and stir until melted. Add the drained macaroni to the baking dish, and then pour over the cheese sauce and stir as it settles and coats all the macaroni. 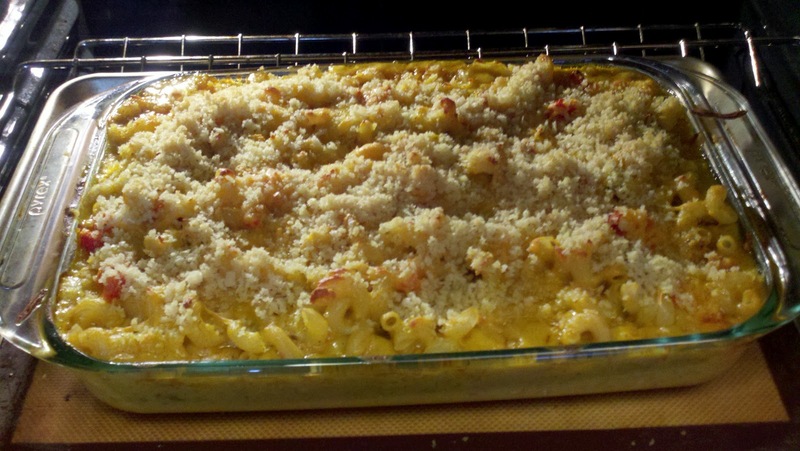 Sprinkle the top with the rest of the grated cheese and the breadcrumbs and bake until the top is golden and the macaroni is hot and bubbling, about 30 minutes. Serve hot. One of my favorite things about this recipe was is the addition of diced tomatoes. Usually when I make mac n cheese, I serve it with stewed tomatoes on the side, but this has the tomatoes right in the casserole. FABULOUS. I remember Chris saying he found himself searching for more chunks of tomato as he was eating. I think maybe next time I'll add a bit more. If you like a lot, add a lot! !